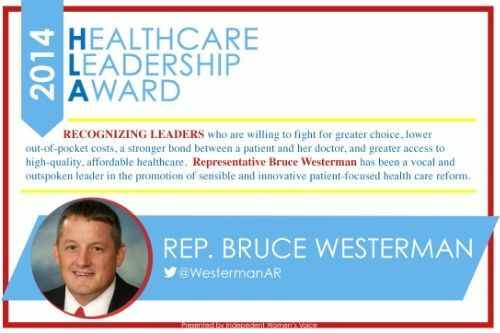 WASHINGTON, DC - As part of Healthcare Solutions Week, Independent Women’s Voice is proud to present State Representative Bruce Westerman with the 2014 Healthcare Leadership Award. He is one of only 15 recipients nationwide. Rep. Westerman has been a leader on the issues and in advancing the policies that are essential to truly improving American healthcare. The Independent Women’s Voice created the Healthcare Leadership Awards to recognize those leaders who are willing to fight for greater choice, lower out-of-pocket costs, a stronger bond between a patient and her doctor, and greater access to high-quality, affordable healthcare. Each of the 2014 recipients has been a vocal and outspoken leader in the promotion of sensible and innovative patient-focused health care reform.